At Surf City Coffee we stand behind every product we sell with a 100% Satisfaction Guarantee. If you are not satisfied with any product you purchase from us, let us know and we'll make it right. Call us toll free at 1.888.SRF.DUDE (1.888.773.3833), email us info@surfcitycoffee.com, and we will fix it. We are a customer focused business and we want you to be a loyal and satisfied customer for life. If you have a question about a product give us a call or email and we will do our very best to get you the information you need. Bottom line if you aren't happy we aren't either! SurfCityCoffee.com is a specialty coffee roaster dedicated to providing you our customer with the absolute best coffee experience available. We use only the highest grade of coffee sourced from the world's premier coffee growing regions. Surf City Coffee is a USDA certified organic coffee roaster licensed by the California Department of Food and Agriculture and by the California Certified Organic Farmers Association (CCOF). 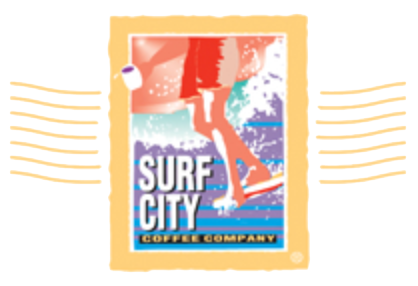 Order online or visit our Surf City Coffee shop - Surf City Coffee: Scotts Valley, CA and choose from a wide variety of speciality coffees and the hottest apparel and surf coffee related products in the tradition of the California coastal experience. Our passion for customer service is unsurpassed. If you are ever dissatisfied with a Surf City Coffee Company product for any reason, please return it to us for a refund or replacement. Shop with us and you will be assured of getting the freshest, highest quality, and healthiest products available.